Her laughter quickly disappeared as Siren stood up. All Chelsea could do was stare at him wide-eyed. It took her moments before she could decide what to do. A small bubbly chuckle arose from her throat. "Haha you don't scare me Siren." she laughed even more. Mocking his stance, trying to appear taller than she really was. Her gaze met his as she turned serious, baring her teeth, but signifying she wasn't about to back down, no matter how small she was. She tail twitched as more adrenaline pumped through her. And she jumped towards him once more, making another attempt to tackle him. How suicidal! A challenge! Joy pumped throughout him, and he began to arouse his own fur to stand. "If you do not fear me, then I cannot call you clever." He snarled again, wrenching his tail back in forth. It lashed quickly as he lunged forth. The wolf only caught a small nip to her ear, but he quickly recoiled. She frowned as he lounged at her, nipping her ear slightly, causing her to lose her balance only for a moment. She growled with excitment as she jumped towards him, nipping him on his tail and sending empty bites towards his legs. She hoped this would distract him enough for her to knock him over. "You'll have to try better then that." she grinned, her ears flat against her skull as she continually nipped at his legs and tail rather than his ears. "If I try, I could easily damage you in such ways that you would only hope for fatality." He backed off, simmering his growl. Now, he stood normally, his face blank again. She sighed he became his normal self again. "Not true." she replied helplessly, although it was true. Chelsea just didnt want to admit it. "Oh come on Siren, your no fun." she said, as she layed down once more with a frown. Adrenaline still pumped through her body as she did not want to just lay down anymore. North looked around and when he was about to leave, something caught his sight. He padded towards the back of the den. It was getting harder to see, but what he did see, shocked him. "Look Macy." he said, and pointed to the object in the back. "It's.....old bones. Looks like a hare or something." North was really intrigued by it, but also scared. What could have possibly killed it? "No fun?" He mocked, yawning a bit. "Pity." Siren watched her with a skeptical eye, lifting a foreleg to begin grooming with a slow tongue. She sighed, trying to think of a way to make him so.. Ungrumpy. Chelsea giggled at the thought of calling him grumpy. Narrowing her eyes at him, she waited until he wasnt watching her, then tackled him once again. She nipped at his ear, hoping he would actually play around this time, even though they werent pups anymore. He eyed her, residing quietly as she nipped his ear. He merely got up and continued grooming, keeping his eyes on his paw. "Hmmph," he grunted, still licking. She watched him, speechless and dumbfounded as he got up and continued to groom himself. Maybe I should challenge him to a race?" she sighed, frowning. "Fine Mr. Grumpy, but Im betting your much slower than me at a race?" she grinned at her choice of words. "Oh please," he grunts again, still keeping his emerald orbs down on his leg. "I am not one for speedy stealth." 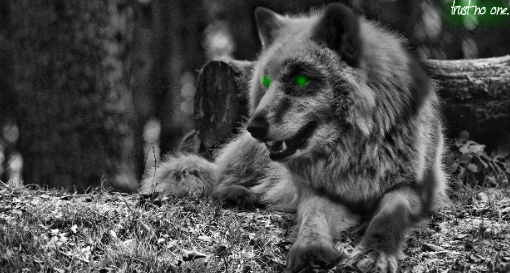 He finally sets his paws down, and looks at her with fiery green eyes. He does not move. "Alright Fine." she sighs in defeat. Chelsea didnt think anything could break through his grouchiness. She frowned, layed down, and stared back into his eyes. "...What about hunting..?" she barely murmured to him. "Hunting?" He asks, laying down. "I'm okay. I appreciate your...elasticity though." He grinned, and laid his head atop his paws. "I'm sorry, however." Siren blinked up at Chelsea. Elasticity? She frowned once more. A question made her curious, but Chelsea wasn't sure if she should ask. "Siren, didn't you ever have a mate of some sort? I'm sure you weren't grumpy all of the time." She sighed while asking the question. Yup.she asked it. "A mate?" He grunted again, peeking at Chelsea with alert eyes. "No." Siren's answer was simple. He did not want to dwell upon the lonesome fact, though he had never really desired love. "But why not? Don't you ever think about having little pups of your own?" she looked at him surprised. Much more different than her brother... She sighed. I must sound very foolish right now she thought to herself. "Pups?" He choked out, grimacing. "Despicable!" Siren snorted, shuffling a bit. He licked his whiskers, yawning again. "You?" Chelsea was shocked at his reply. How could one not love pups?! She looked down, thinking of her sister as she spoke. "Of course, I've always dreamed of having pups, but I have never found a mate, so that dream has been on hold for quite a while." she chuckled lightly. The jet black wolf, Aaka, was in a playful mood. Her eyes darted around, and she caught sight of her tail, which was flopping around amiably. She growled and thumped her tail, chasing it around and around. Soon, she got bored of this, and ignored her tail. She then galavanted around the territory, sniffing every rock and searching every hole. This too, she became bored of. Then finally, an idea she had been trying to shut out and it had arose again: Climbing. It was her decision, stay and be bored, or climb to a high cliff and see everything. 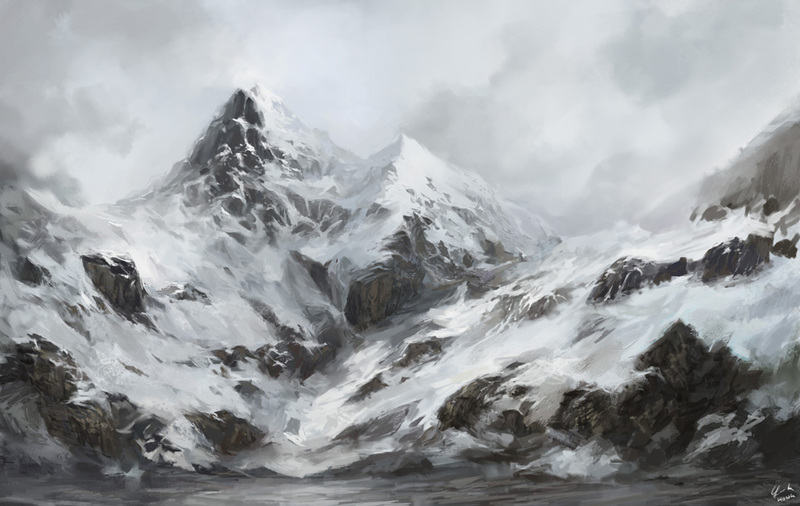 She chose the latter, and seeing really no harm in it began to ascend the mountain. Chelsea wrote: Chelsea lifted her head high enough to look up into the male's eyes. Her ears perked at his question, but her response was caught in her throat. She slowly crawled back, leaving a small distance between them. "I'm Chelsea." she barked lightly. "And you are?" her head tilted slightly as she stated her question. Chelsea stared into his bright yellow eyes, not breaking her gaze. The large brute examined the smaller fae as she backed away. Then finally after an while of silence he spoke "I am Marrok, nice meeting you Chelsea. And I ask again what is your business here?" The white and red marked brute had an serious tone that was slightly lifted to a friendlier tone but still it was as serious as an bear charging towards you. When she, Aaka, got to a high cliff, she paused to catch her breath. This mountain climbing stuff was hard work, and now she was desperately in need of water. An idea popped into her head as she remembered the running wolf who ate the snow. Water...Hmm...Perhaps she could use this improved snow for water. Yes, that was it! She licked up a mouthful, then she licked up some more. Her dry tongue gave a sweet sensation as it became moist, She returned to her journey, now refreshed. Sharon smiled as Ken went to greet other members. When she saw he was talking with Shin, she looked around and trotted over to a new female(Chelsea) and smiled. She saw her talking with Siren, so she sat back. She looked around and saw another female on the mountains. She smiled and looked back. The beast pressed a large paw in the snow, marking a temporary engravment in the frozen precipitation. With a gently huff, the wolf let a fleet of frost breath spew from his nostrils. 'Lovely..' he remarked in his head, laying down. 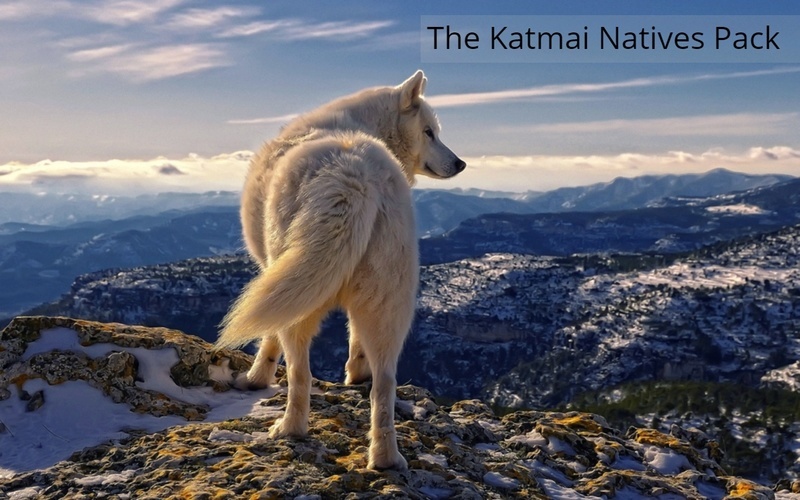 Lennon was walking around the area when she saw a white wolf sitting down on the white crisp snow. The fae knew it was Siren, so she walked over there to chat because she hasn't talked to him in a while. She sat down and glanced at the brute. "Hey Siren, how are you doing?" "Evening," he grunted, twisting his head in the snow to look at Lennon. The Wache was quite loquacious, and he smirked a bit. "I guess you have come to dwell on the fact that I am so boring, correct?" He peeked at her, grinning, but layed his head back down.